This is a family of daytime flying moth. 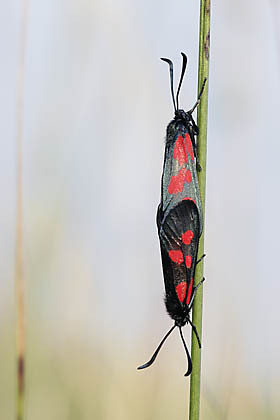 The five-spot burnet and the New Forest burnet are the most common species in mainland Estonia. The five-spot burnets appeared already after Midsummer, the New Forest burnets in the first week of July, but it may vary locally. 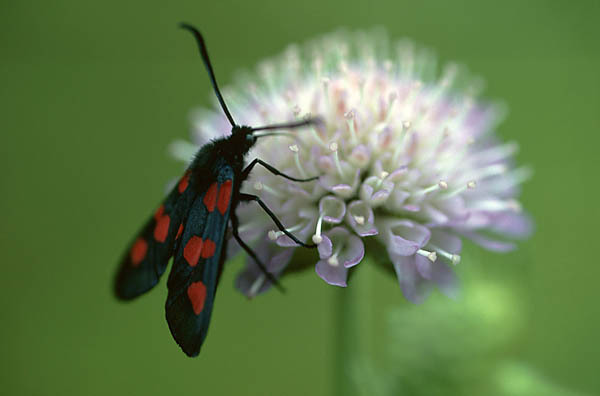 The five-spot burnets left no single scabious (Knautia) flower unvisited – a clear favourite but as summer progresses things change. The New Forest burnets will not fly so high up and the nectar of lucerne (Medicago) seem to taste best at the moment. Active in daytime, and very openly so. During the hottest period they rest on flowering plants or grass straws. Red-black is a warning colouring in nature, and so bearers of these colours have no particular need to hide. The yellow liquid secreted by the burnets is toxic for birds. The body and forewings of the burnets are metallic blue, with red patches or bands. Note the different shapes of the antennae. The flight image is smoothly slow. They are not shy of humans, even let themselves be taken up in the hand, so a thorough study is quite feasible.